Phoning our energy company. Deep joy. If I’m honest, I don’t like phoning anyone. I prefer email or text message – less room for misunderstandings when something is in writing. But we got a letter with some words in red! Apparently, energy companies now have to inspect your gas and electric meters every two years to check they are safe. I’d ignored the first letter because, well, another regulation passed by disconnected politicians who are totally unaware of the chaos they cause by passing blanket laws. At least I understood that this one could save lives for some people who live in housing with a dodgy landlord or a dodgy energy meter. Unfortunately, our energy company can’t even get my name right – everything is addressed to ‘Mr D L Egan’. It’s ‘D J’ as in Trump, unfortunately. Nobody types the ‘www’ anymore! And… the letter said to phone you, with no mention of being able to do this online. So that goes on for five depressing minutes as I lose the will to live. Second hurdle: Over friendly human asking about my day. Look, were not friends, we’re never going to be friends. We’re probably never going to speak again after today. Let’s just get this over with as quickly and efficiently as possible. (If you really want to know, I’m sat here in my PJs just before I go and shower. I want to get this over with before I start my day because I hate phoning large companies). Why? The ‘D L Egan’ has grown on me. At least I know communications are definitely from you when I see this error. But OK, lets correct my name. Let’s even lose the middle initial. 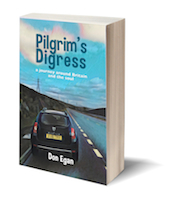 ‘It’s Don Egan,’ I say. ‘Sorry, I missed that Dan. Could you repeat your address? ‘My name is not Dan? ‘Oh, I see, sorry Don. OK I’ll correct that. We get through the address and then update the email and check the mobile phone number. To be honest, by this point I was feeling like a vulnerable person being forced to jump through hoops for the amusement of others. Twelve minutes I was on the phone before we got around to booking the meter inspection. Monday at 3:55pm the man came. He checked the meters were safe – well they had only been installed about two years ago so I hope they are! It turned out I’d only been booked for the electric meter check. Arrgh! ‘I’ll log that I’ve checked the gas meter as well,’ said the young man, typing something into his iPad. He also read the meters, even though they are Smart Meters and are linked direct to the company 24/7. Well, the meter reading was part of the inspection. Two days later, another man came to read the meters from the same company! No scam – they both came in company vans, with boiler suits with company logo and full ID. We never saw this many meter readers before we got the Smart Meter. For some reason, I’ve taken to sitting in a dark room in the afternoons rocking backwards and forwards. I know that we should not laugh at the misery of others but I must apologize beforehand that I have done so. May I suggest a career in stand up comedy. I know that it was a legitimate rant but you made my day, thank you for cheering me up.